Host band Second Line Social Aid & Pleasure Society of Somerville, MA. 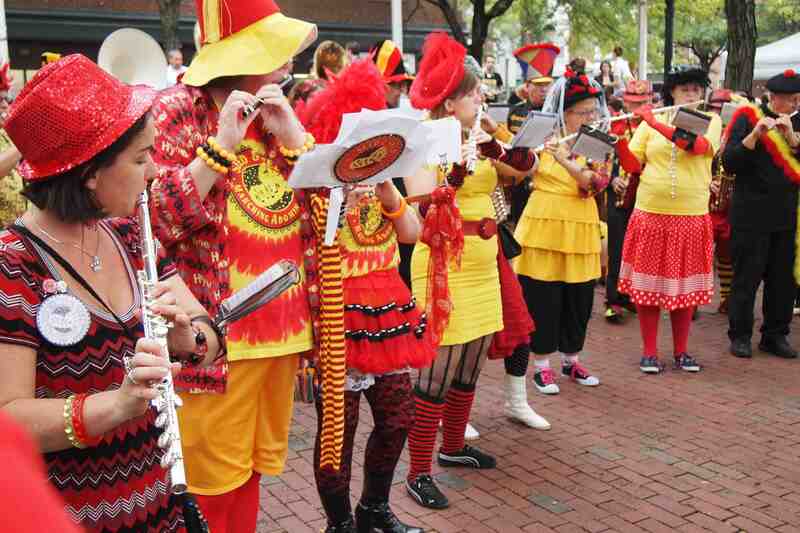 Last weekend I went to the Honk Festival in the Boston suburb of Somerville. It was awesome, exceeding my expectations in every way. It is also nearly impossible to describe. 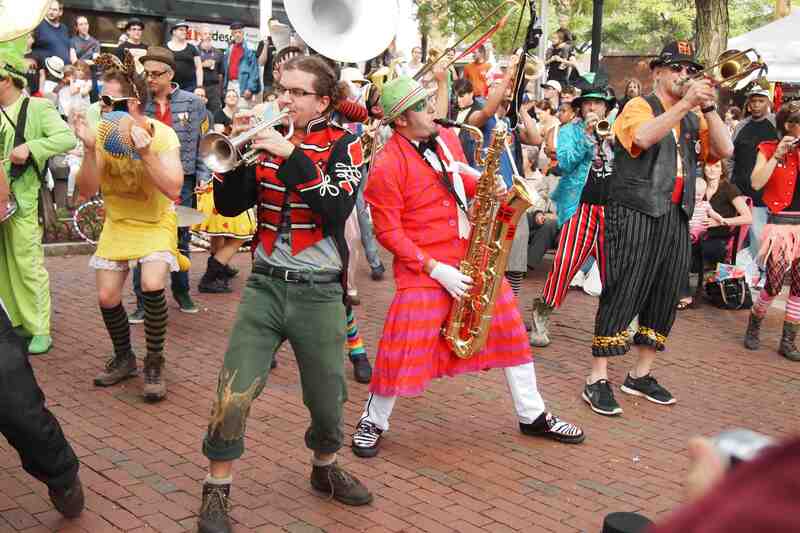 Loud and fun, the colorful bands played, danced, and paraded in parks and alleys around Davis Square on Saturday. 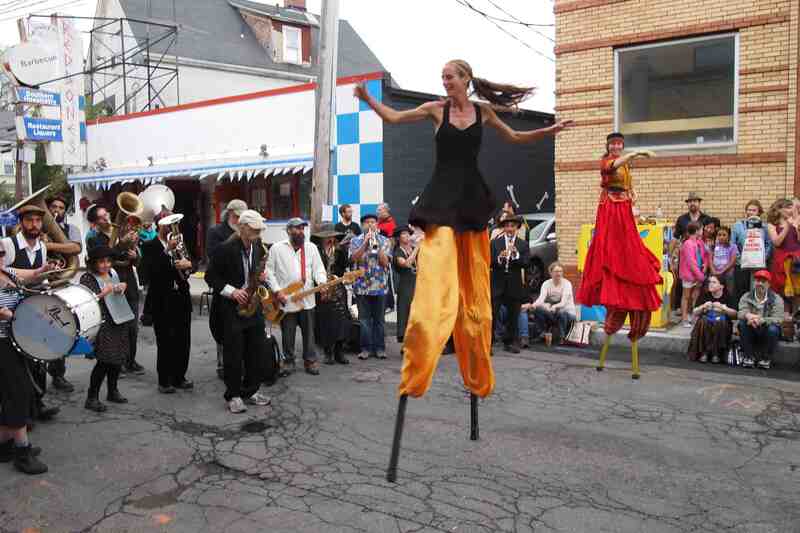 There were lots of horns, drums, stilt walkers, dancers, and hula hoops, and not a single stage. That’s one thing that makes Honk so special, the lack of boundary between audience and performers. What Cheer? Brigade from Providence, RI, performs among the spectators. 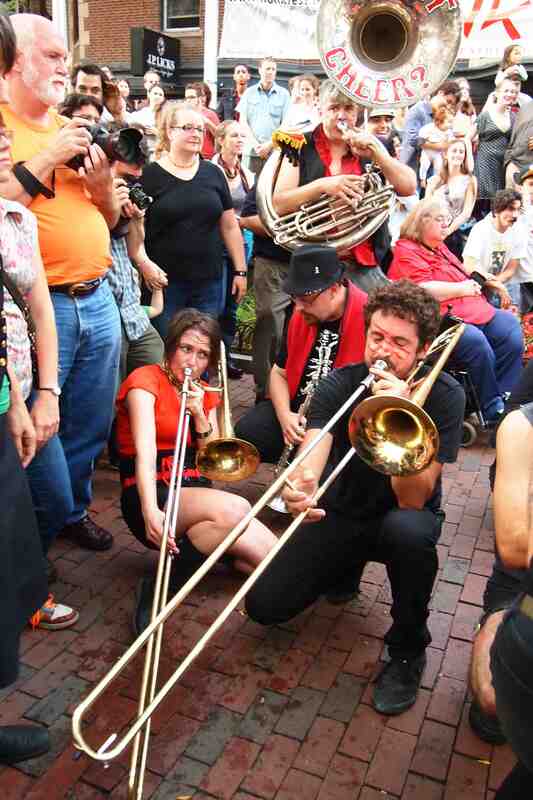 Some of the musicians involved were local and others traveled from locations around the country, from the Brass Messengers of Minneapolis, Minnesota, to the Chaotic Insurrection Ensemble from Montreal, Quebec, to the Minor Mishap Marching Band of Austin, Texas. Environmental Encroachment band of Chicago, IL, wowed the crowds with fun antics and unique costumes. 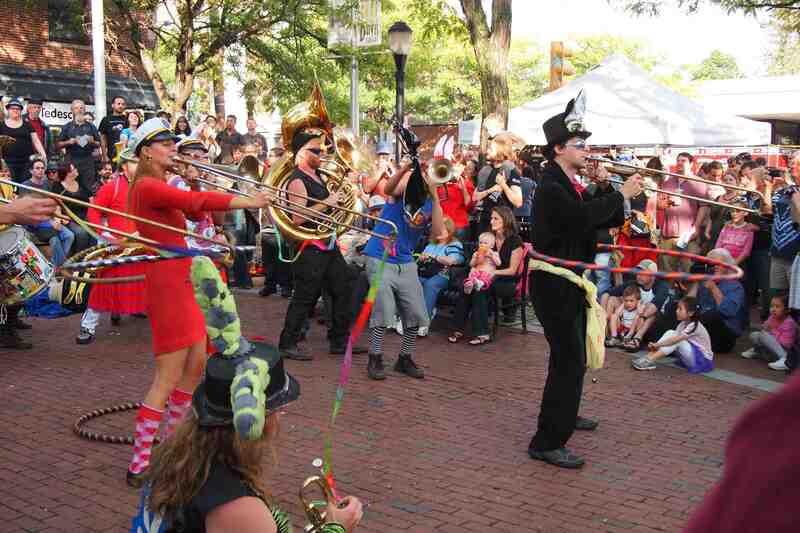 Though billed as a festival of activist street bands, I think political agendas were secondary for Friday, September 30 through Monday, October 3. The mission was spreading the joy of music and taking back public space for the purpose of sharing music. 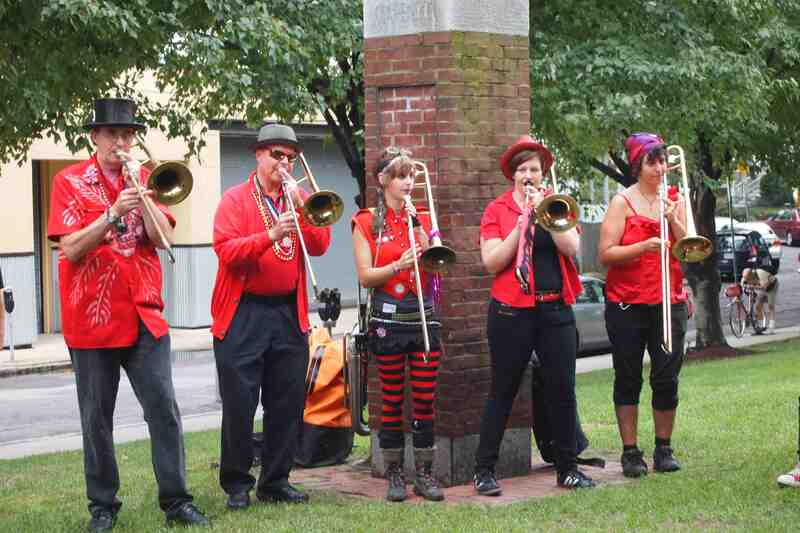 Musicians "took back" the streets of Davis Square, at least for the weekend. 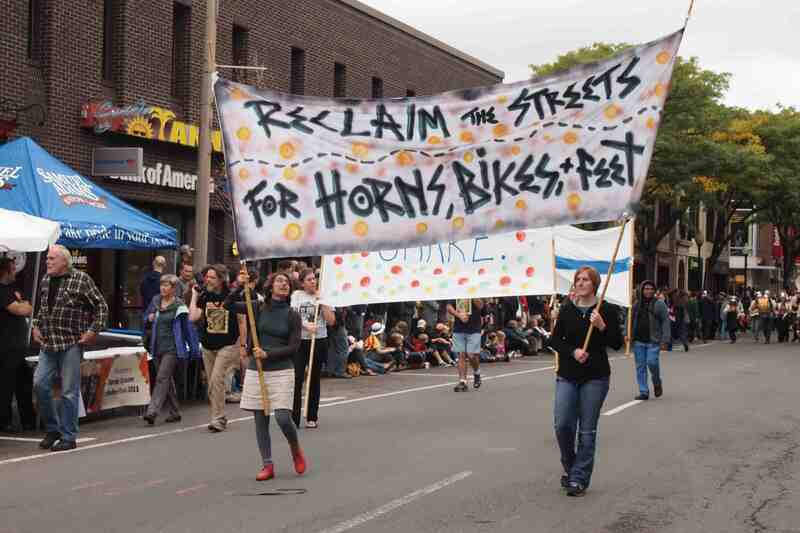 Honk is a completely grassroots, nonprofit operation with no promoters and no outside food vendors or stalls selling junk. So, the area businesses and residents benefit from the festival, and in turn, show their appreciation by donating funds, as well as housing and food, for visiting bands. I know lots of people who can hula hoop, a few that can play trombone, but I've never seen anyone do both at the same time before. Host band Second Line Social Aid & Pleasure Society Brass Band of Somerville began the festival in 2006 in an effort to connect with other similar-minded street bands. It was such a success that it has become an annual event, usually held Friday through Monday on Columbus Day weekend. Seed & Feed Marching Abominable from Atlanta, GE. Sunday there was a Honk parade that brought the band’s and other community groups from Davis Square to Harvard Square, where they entertained at an Oktoberfest celebration. That evening the bands took to the water at Boston Harbor where they performed and cruised aboard the Provincetown II. Monday a Honk Symposium was held at Harvard University Graduate School of Education, followed by performances at Boys and Girls Clubs around greater Boston. 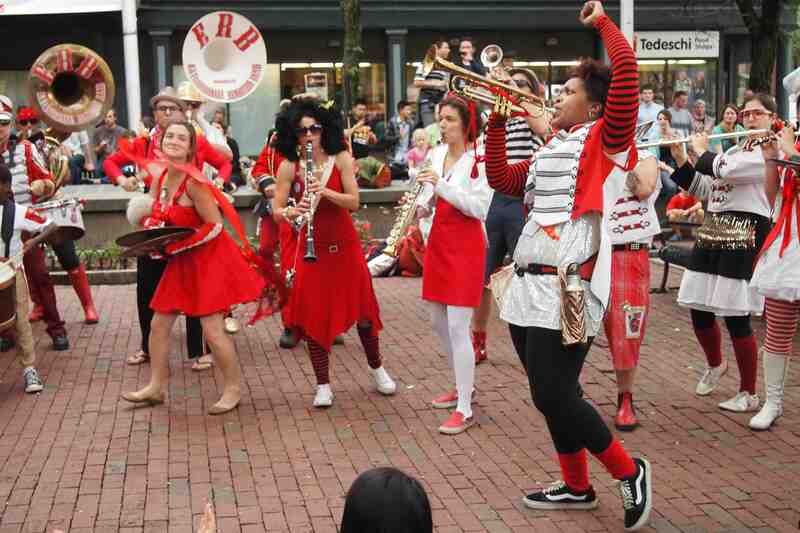 Extraordinary Rendition Band from Providence, RI. Some Honk participants from other states have been so affected by it that they went home and started their own “Honk band” and in some cases their own Honk festival, including Pronk in Providence, Rhode, Island; Bronk in Brooklyn, New York; HonkWest in Seattle, Washington; and HonkTex in Austin, Texas. The Bread & Puppet Circus Band from Glover, VT, has been an activist band for many years.